Posted on June 15, 2018 by ngfmarketing. 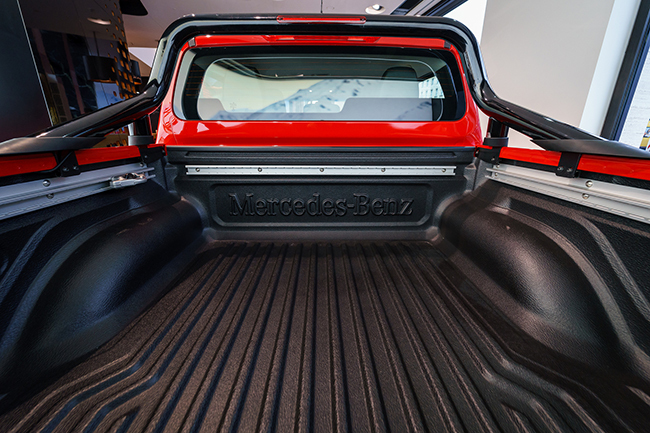 The bed of your truck is built to be able to transport heavy items. However, without adequate protection, your bed is going to experience wear and tear the more you use it. It’s not uncommon for pick up truck beds to get severely scratched and dented due to the loading of heavy items that may shift in place during transport, especially if those items have sharp corners and aren’t properly secured in place. Such scratches and dents can be very unsightly and can be expensive to fix. To prevent such damage, you should consider investing in our Rhino Lining spray. Rhino HardLine is a bed liner that can be sprayed on to make your truck’s bed tougher while also offering color stability. It also provides a non-skid grip to your bed that will prevent items from sliding around. Besides helping to protect your truck bed from scratches and dents, it will also protect against the development of rust. This is because the lining will form permanent watertight and airtight protection against rust and corrosion. In addition to trucks, its ability to bond to metal, fiberglass and wood surfaces means that it can be used for a number of other applications as well, including trailers, boats, military vehicles, flooring, buildings and more. Rhino HardLine has excellent resistance to chemicals and abrasion and will remain flexible under harsh temperatures (from -40 degrees to 190 degrees Fahrenheit, to be exact). It’s easy to apply and will dry within ten seconds of application. After only 24 hours, your truck bed will be ready to use in whatever way you need to use it. Besides the fact that Rhino HardLine will provide a non-skid, durable coating to your truck bed that won’t crack, peel, lift, or rust, it’s also environmentally friendly. The lining is 100 percent solids by weight and volume, and it does not contain any solvents or VOCs (volatile organic compounds). Will fit any size – Drop-in liners may not fit your truck perfectly even if you find a drop-in liner suited for your truck’s specific dimensions. You won’t have to worry about the size and shape of your bed when you use a spray-on bed lining, making it a much more flexible and convenient option. Won’t shift – Even if you have a drop-in liner that seems to fit your truck bed, it may begin shifting over time. This can damage the paint of your truck, thereby negating the entire purpose of having a liner in the first place. Won’t experience damage – Drop-in liners can crack or rip. Not only can they experience damage in such a manner, but such damage will leave it vulnerable to moisture, which can cause corrosion or rust to develop. Looks better – Drop-in liners often look a bit clunky, and if they’re damaged they won’t look good at all. You won’t have these issues with a spray-on liner. Not to mention that spray-on liners are available in all kinds of colors to match your truck, whereas drop-in liners are rarely customizable. Not only will our Rhino HardLine spray-on liner protect your truck bed from damage, it will prevent rust and corrosion as well. Contact us at Z-One in Toledo for more information today.